There are many casual gamers like me who are fine with a 21.5-inch gaming monitor surprisingly offering a wide view and fluid display. Gaming is all about the fast display speed, which is essential for fluid pictures during the fast, on-screen motion. To enjoy this pace, the ASUS VX228H offers the impeccable response time speed. 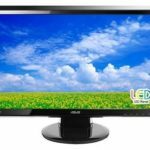 While searching for gaming monitors in the 21 to the 22-inch collection, I found that just a handful of models are offering a response time speed of only 1ms. Thus, for me, a genuinely good response time became the critical factor. Obviously, I was looking for a model with 1ms response time, as it is the best specification required for keeping ghosting or shadowing of quick actions away. Further, I also kept my major requirement in mind, which was having a gaming monitor only for use with PlayStation (PS) 3. I was looking for a small yet functional model known for its high-quality gaming display without costing as much as the gaming console itself. Considering these requirements, the ASUS VX228H PC monitor seemed a promising one. It is clearly a gaming monitor with 1ms response time, which is virtually imperceptible to the human eyes. The monitor comes with a 21.5-inch wide viewing panel and a resolution of 1920 x 1080 for Full High Definition (Full HD) gaming. Upon knowing these specifications, one can easily conclude that ASUS knows how to balance good technical specifications and price. Further, it has always been praised for its product reliability, which is its biggest strength versus the other brands. With 1ms response time, this monitor is genuinely a strong contestant for gamers who wish to get rid of the ghosting. Similarly, there is no issue of dead pixels or flash lighting/bleeding around the edges. The quality control in terms of these aspects is truly appreciable. The wide viewing angles are superb but they do not match with the IPS quality, in terms of holding the color. The colors/contrast are decent for the price, although the depth might not be significant. The higher dynamic contrast ratio than those of a few high-end monitors is another plus, as it dynamically adjusts the luminance to deliver an ideal contrast look. You get to see real images with good colors but without data loss or distortion. Further, the brand’s Video Intelligence technology achieves a perfect balance of color, contrast, brightness, and sharpness. There is no issue of flickering as well. The full HD LED monitor is optimized for the finest quality for both colors and images. Although the monitor ships with a level of 100% brightness, turning to the ‘standard’ mode reducing the brightness up to 50% delivered most real colors while playing. 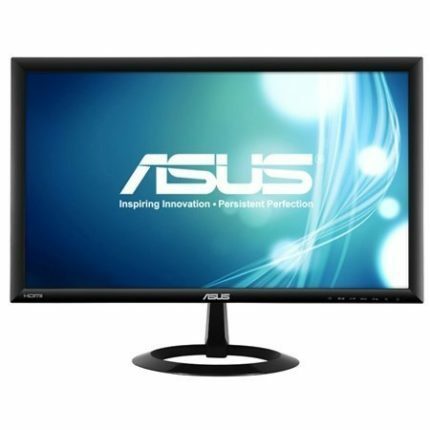 I had purchased the ASUS VX228H 1080p monitor by looking at its 1ms response time. Believe me; this is ideal for FPS games and other games demanding accurate frame inputs. You can easily rely on it for battling and competitive gaming. Those who play fighting games and other games know what it can cost to miss even a single frame. So, this monitor truly delivers what these gamers need. Although not better than those IPS monitors in terms of color quality, the performance is quite good and noteworthy. 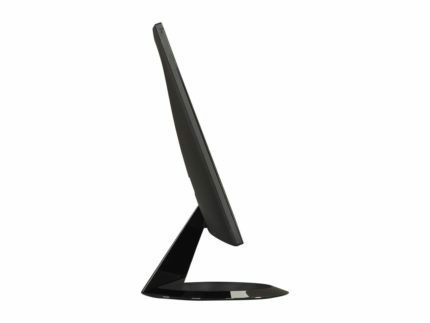 The ASUS VX228H TN monitor is sleek and slim. The thin dimensions with the trivial footprint allow you to place this model even on a not-so-wide table. The finish is matte, not glossy or glass; which I appreciate for gaming or daily use and here is why. As per my experience, glossy/glass screens are unpleasant, as they are highly reflective. This is quite distracting and triggers a headache, although the colors tend to pop out more and gives a high-quality feeling. For gaming, I always prefer matte, as it is essential to see clear details without being distracted by the reflections. Still, I do not criticize glossy screens, as they are ideal for watching multimedia. Because I use the monitor more for gaming and somewhat office use, I stick to matte. Although the design is simple, it is the sundial-inspired one. As it embraces the ultra-slim profile, the overall look is truly appealing. There is no compromise with the style, durability, and stability. Coming to the stand, it is extremely sturdy. This is unlike the other monitor stands that are wobbly and flimsy. However, the ring-shaped foot consumes a slightly more desk space than those of the other monitors having the same size. Still, I have no issue with it. Moreover, the stand is not detachable, which on the positive side, add to durability. Another aspect about this the ASUS VX228H monitor, which I liked, is its ability to remove the hassle of connecting to more devices. With 2 HDMI ports, you can run two more devices such as gaming console and PC at once, without investing in any costly switches or splitters. Further, the addition of an AUX-out port and two speakers allow running the audio for all the devices. However, the speakers have limited potential. Still, you can enjoy listening to all types of audio. The speakers are not extraordinary but are like those of a laptop or a smartphone. The fact that they are invisible is truly commendable. The two HDMI ports are on the rear of the panel, which eliminates fumbling for plugging cables. Further, a small power cord goes into a power supply socket instead of a fat cable going into the rear of the display. This is favorable, as it simplifies the task of concealing cables. 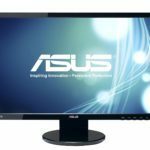 The ASUS VX228H display is for those who are looking for a monitor for gaming or office use at an affordable price and with a straightforward and solid 1080p performance. At the moment *May 2017), the ASUS VX228H price amounts to only$130. The technical profile is not that high but is also not low due to which it should not be unpleasant for anybody who buys it. I would not recommend this monitor for graphic designers for whom color accuracy is one of the priorities. However, it is ideal for enjoying shooting games as well as your wallet. The thin dimensions, full 1080p video viewing, flicker-free technology, 1ms response time, and two HDMI ports make this monitor an ideal budget gaming piece. Consider it if you wish to connect two devices such as a PC and a console, a tablet and a smartphone, or two gaming consoles for maximizing entertainment.